3 years & up. Block Science, as a pioneering extension of the unit blocks system, adds a rich introduction to physics and essential cognitive development to traditional classroom block play. This Foundation Set is designed to exercise early engineering concepts, collaboration, and the study of matter, motion and mathematics. Plastic building and roadway clips stabilize builds, drawbridges and loops to enable taller, sturdier and more mobile tracks and builds. 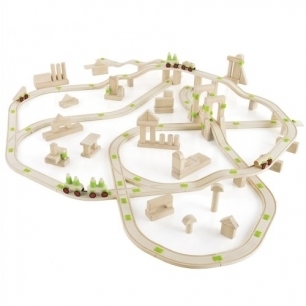 Simplified, wooden cars with soft plastic wheels easily glide across the solid wood tracks while carrying algebraic people designed for mathematical and dramatic play activities. Foundation Set includes Concept Cards for building examples and language associations. Made from beech wood and polypropylene plastic. Requires standard unit blocks for proper building experience and is ideal for two to three groups of builders. 155-piece set.